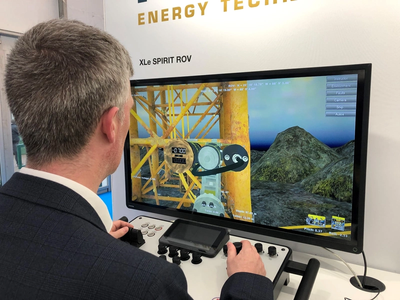 The latest version of Forum Subsea Technologies’ VMAX simulator launched this week is designed to integrate with its next generation of electric remotely operated vehicles (eROV). The XLe Spirit was the first vehicle to be launched from the new range last year, and Forum announced on Wednesday that it has now added the eROV to its choice of vehicles within the simulator. The new lightweight and ergonomically designed eROV Hand Controller console can also be interfaced to VMAX to allow pilots to be trained in the use of the new console. The VMAX software is a 3D ROV simulation system which is predominantly used for the training and evaluation of ROV pilots. It can also be utilized by subsea engineering teams for modeling and verification of procedures involving intervention tasks for subsea equipment. Andy McAra, VMAX product director, said, “Following the launch of the XLe Spirit vehicle last year, we recognized the need to integrate the system into our existing VMAX software to provide both training and evaluation capabilities for our customers.